Wasp QuickStore RapidStart is your complete point of sale solution, designed to deliver superior customer service and improve profitability. 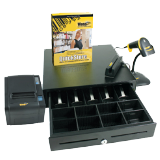 Ideal for new businesses and single store retailers upgrading from an electronic cash register, the RapidStart solution blends affordability with the features your business requires. The RapidStart solution includes hardware and software, for easy installation and use. 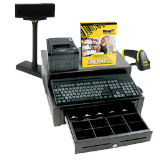 Featuring POS software, cash drawer, barcode scanner, magnetic stripe reader, and receipt printer, RapidStart includes everything you need to get started– just add a monitor and PC. 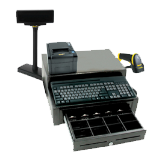 The POS components offer USB connectivity for easy set up. Training is simple, with integrated video training tutorials and Help menu. QuickStore RapidStart includes QuickStore Standard edition software, delivering the flexibility to add additional lanes and stores as your business expands. And unlike other point of sale solutions, QuickStore includes one free year of technical support, available for annual renewal – so support is there when you need it. Wasp QuickStore allows you to process sales transactions quickly, easily completing returns and accepting multiple payments for a single purchase. Accurately capture customer and product sales information. Manage inventory on-hand, and track sales to determine which products are selling well. Access the data you need to accurately manage your retail business and improve efficiency – all in one intuitive solution.